Employed at Botanical Research Unit, Stellenbosch 1981 - 1992. Obtained M.Sc. (Botany) from University of Cape Town in 1983 for the study of the vegetation of Swartboschkloof, Jonkershoek near Stellenbosch. Surveyed the vegetation of the southern Langeberg, 1984 - 1994. Moved to Kirstenbosch Research Centre, National Botanical Institute in 1993. 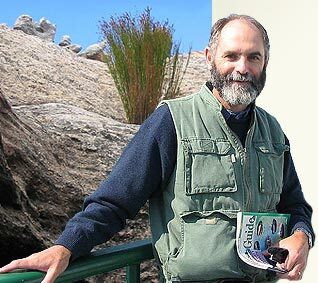 Awarded doctorate (PhD) in 1995 by University of Cape Town for the study, 'Phytogeography, Endemism and Diversity of the Southern Langeberg'. Managed the Vegetation Map of South Africa Project (VEGMAP) 1995 �-- 2000 (National Botanical Institute). Joined the staff of the Botanical Society of South Africa in August 2000 as Deputy Director later to become Director: Botanical & Communication Programmes. Bergwind Botanical Surveys & Tours CC. established as private enterprise in December 2005.